WACOSS supports the recommendations in the Royal Commission into the Protection and Detention of Children in the Northern Territory report, and is pleased that the recommendations have focused on early intervention measures that aim to keep young people out of child protection and youth justice systems. WACOSS has championed for therapeutic approaches to health, education, and the prevention of harm, following the report into Western Australia’s youth detention centre, Banksia Hill, and is pleased to see this appraoch included in the report. WACOSS is pleased the outcome of the Marriage Equaity survey was a YES from the Australian public, and a YES majority in every electorate in WA. This is the first step to achieving equality. It is now imperative that legislation that is passed is fair and just, and safeguards anti-discrimination protections. WACOSS is working closely with the Department of Communities in light of the National Housing and Homelessness Agreement (NHHA) Bill. We are advocating for Equal Remuneration Order supplement payments, and to ensure that homelessness services are kept informed, emphasising the need for a co-design consultation with homelessness services that are place-based. We are looking for skilled and innovative representatives from the community to help shape an effective and vibrant event, for which planning is already underway. As a committee member you will provide input into the program, review abstracts, and assist with the Community Services Excellence Awards (CSEA). If you would like to nominate, or know someone who would be perfect, we'd love to hear from you. 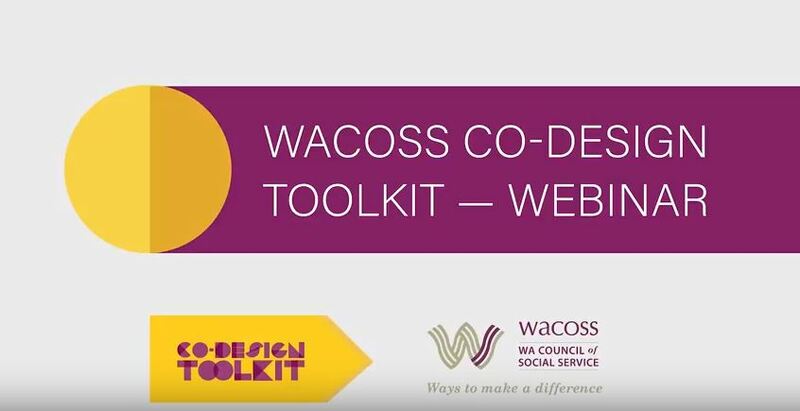 The WACOSS Co-Design Toolkit is the focus of a new webinar that introduces the tools that government, community sector, and consumer representatives can use to make sure that new services and programs are designed to truly meet the needs of service users. The webinar is presented by Stuart Reid of WACOSS who had a key role in developing the Toolkit. Consultation with Albany community service organisations identified a need for a local workshop in grant writing, submissions, and tenders, which will be held on Monday 4 December in Albany. This workshop will coincide with Natural Disaster Resilience Training being rolled out in regional centres across WA. The impact of trauma is the theme for a workshop in Mandurah on Thursday 7 December from 9.30 – 2.45. The workshop, delivered by the Sexual Assault Resource Centre as part of a Lotterywest-funded regional training project, is free for any community sector agencies working in the Peel Region. The workshop is in three parts: Impact of Trauma; Building on Trauma Knowledge; and Vicarious Trauma. The free Mandurah workshop is one of many training options available to community service organisations. As part of a grant, WACOSS can provide free customised training in regional WA, in a range of areas, from co-design, to advocacy, to governance. Complete the online survey, detailing your local training needs, from there, WACOSS will develop a training plan that can provide up to two days of workshops, in regional centres over the next 18 months. Regional Development Australia (RDA) Pilbara successfully launched the North West Aging and Aged Care Strategy. The Honourable Ken Wyatt, Federal Minister for Aged Care and Indigenous Health travelled to the Pilbara to officially launch the strategy. Mr Kevin Michael MLA, Member for the Pilbara was also in attendance, together with 59 representatives from the aged care and NFP sectors. Anglicare is holding a two day workshop covering case management and case planning for families that present to an agency with a single problem, but on engagement multiple issues and problems are identified. Participants will explore the basic principles of case management when engaging and working with multi-problem families and the development of appropriate plans. WACOSS eNews Subscribers are invited to join a webinar on the opportunities and challenges of collective impact, on Thursday 30 November. The webinar will focus on leadership, governance, community engagement, and evaluation. The webinar will draw on recent literature to consider these issues. The Department of Education is hosting a repeat forum from 2 – 4pm, Monday 4 December to explore elements of the Evaluation Report and service delivery model, and request feedback from participants on the procurement process to select operators for the 21 centres. Register for the session via email nisha.ladhani@education.wa.edu.au or 08 9264 4149, no later than Thursday 30 November.